During the week prior to Canada Day, woodcarvers come out to show their skill at woodcarving. This happens every year at this time and each year the carvings are unique and some are just amazing. They have 4 days to complete their project. The weather was yucky wet the first day or two and then for the July long weekend we had a heat wave. So I took a few pictures to share with you. This will be a lengthy post with lots and lots of photos, so spend some time, sit back and enjoy. Then the shaving of the bark for some carvers. The skies looked ominous that first day, but most seasoned carvers came prepared with tent tops. Some carvers strip their wood of bark, some incorporate it into their art piece, and others just jump right in like this guy. He obviously has A Plan (you will be surprised)... didn't take the bark off or even mill around chatting with anyone...he attacked the wood with a huge chainsaw right from the get go. This lady delicately shaved the bark with her little chainsaw. Each person has their own technique. And those tools need constant sharpening during the process. Soon it was 'start the engines' , and the chainsaws were all fired up and thus began some serious sawdust making! Novice carver, she looked 16 yrs old with that cute little face, but she was probably older. No problem handling that chainsaw. There were quite a few female carvers this year. As I said, lots of sawdust in the making. And chunks of wood everywhere. Pretty noisy worksite I tell you...all those chainsaws ripping! The smell of cedar, wet sawdust, rain in the air, the smell of the sea and added to it, the smell of oil/gas from the chainsaws...it's a 'memory' smell in the making. Accidents do happen around chainsaws, so medics were on site the whole time. I didn't hear of any serious wounding tho'. The chips, chunks and sawdust all has to be moved out of the way as the projects progress, so enter the volunteers (mostly seniors, bless their hearts). They had their vests and gloves on and with their wheelbarrows before them, they worked continuously. Here's a few pix of the shoreline along which these carvers are working. It was pretty humid out there and even tho' it seemed on the cool side to me, the carvers were all breaking a sweat. It started to rain so this gal headed home. I will check out the carvers again tomorrow. Closer view...can you guess what it is? The volunteers were hard at it again on the 2nd and 3rd days. It's not always apparent what the carving will be. Still overcast...but it would be the last clouds we'd see for quite a few days. We have your traditional coastal carving...the eagle with salmon. and a beaver at the foot of the carving. Aboriginal eagle carving...Won First Place out of all the carvings. The bottom beak is moveable, there is a small being in it's mouth, the copper eye is beautiful. I am not sure what type of bird this is but the piece is entitle "Early Bird gets the Worm"
A school of fishes entitled "Bait Ball". The one side of the carving is netted. Mother Bear and Two Cubs...I've seen this particular artist's bear carvings before...the fur detail is amazing. This hummingbird is one of my favorites. I love hummers! This is an aboriginal design as well. Note that the hummer is attached only by the tip of it's beak...tricky carving I would say. This is a carving of a Snowy Owl. The artist has named it "Snow Ball". A modest little carving of fishes from a novice carver who calls it "I've got your back". Bear begging for food from a little dog...I believe the doggy bowl of food said Griffin on it. That's about it for natural elements....lets look at some not so 'everyday' carvings...those of fantasy. This was is entitled "Where in the Gnome am I" Weird title but I like the addition of the little lantern. Not bad for a novice carver I would say. I've love to have this bench in my backyard. Could put a candle in the lantern I'm thinking. 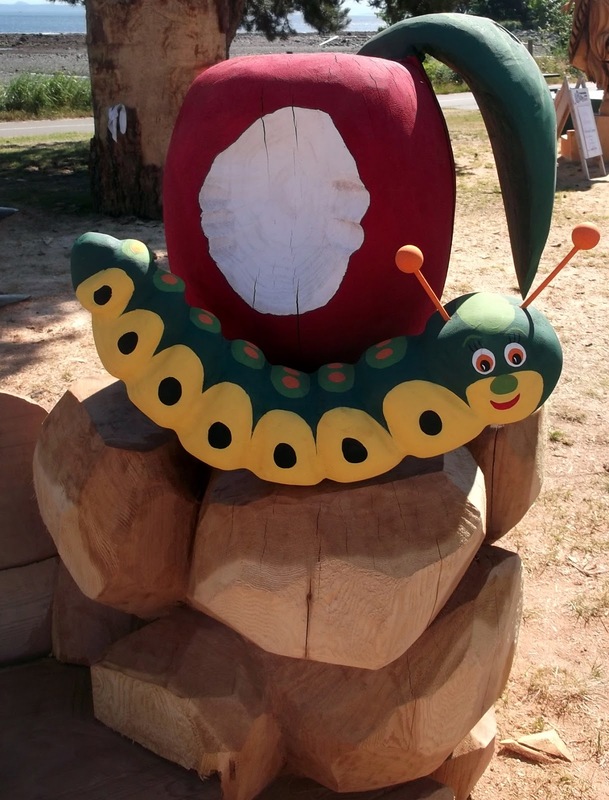 And here we have another little bench called "Hungry Caterpillars". Wouldn't kids love this! The Dwarf....carving entitled "You cannot toss a Dwarf". NOW LETS TAKE A LOOK...at some real fantasy carvings! This dragon is holding a bowling ball. Carving entitled "Marbles Anyone?" This one is called "Altarego". There was one carving that was totally abstract. This is the young female carver I mentioned earlier. This is all one piece. She named it "Tri". Pretty amazing for a novice. WELL HERE IT IS...entitled "Watch the Children". It towers over all!! The backside... a pouch of little ones! As you can see, the annual chainsaw carving competition brings in a variety of talented and skilled carvers/artists, with a diversified subject matter. From the natural, to the 'isn't that cute', to "yikes, what is that!!!". What happens to these now? Well, some are auctioned or raffled off. Some are bought by businesses who display them in front of their offices/stores. Some are bought by individuals for whatever reason. All over out town you can see carvings from previous years...in people's yards and end of driveways or placed in store fronts. I am so accustomed to seeing them that I don't notice them much anymore, only when tourists or new visitors to town mention or point them out do I take notice. But each Canada Day I make sure I venture out to look at all the new carvings and stand in awe of what comes out of a trunk of a cedar tree. Hope you enjoyed my tour...I know this post is lengthy and this isn't even the half of the pictures I took of every nook and cranny of the carvings. Here are a few pictures of the sunny seaside. A carving from a previous year. The tide was definitely out. This is the local arts' society headquarters and gallery, which is right next to the carving area. I love the look of this little cottage. I hope you enjoyed this tour of Transformations on the Shore.